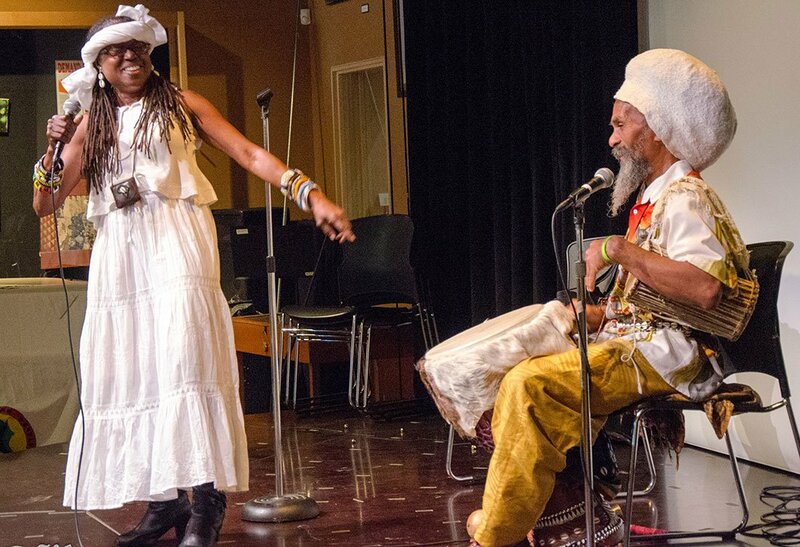 Once again multi-talented Sister Kujichagulia with her powerful African dance and conscious, hard-hitting spoken word will grace the stage at African Liberation Day in Oakland, CA on Saturday, May 25, 2019 at the Tassafaronga Community Center. A renaissance woman, Kujichagulia, is one of the musicians and cultural artists highlighted in the Arcadia Publishing book series, Images of America: Black Artists in Oakland (2007). She is a Griot (Djialli Ba) – an oral historian who utilizes music and poetry to reveal history. This spoken word artist plays trumpet/cornet and percussion. She dynamically orchestrates African music, Jazz, and pop into a hypnotic rhapsody. Her performances include the World Drum Festival, National Black Expo, the John Coltrane Festival, and Nelson Mandela’s 1990 USA Tour. Between 1990 and 1999, Kujichagulia was the cultural director and co-leader of the African Roots of Jazz. Her production piece, Racism & All that Jazz: The Evolution of African-American Classical Music has received national acclaim in the USA. As always, she will be accompanied by master drummer Val Serant. If you haven’t had the opportunity to see Sister Kujichagulia, don’t miss this opportunity to see one of the most positive and uplifting cultural performers in the Bay Area. Kujichagulia performs with Val Serant at ALD 2014. Photos by Khani.